This review is for Alice’s Tale, a digital “light novella” written by Tadanori Kurashita, with illustrations from Poyoyon Rock. This story was released in both Japanese and English in 2014, the English translation resulting from a contest hosted by Conyac and Impress QuickBooks. Imagine a future where you can read a book on your mobile phone! The future is now apparently, and Alice’s Tale receives the distinction of being the first story I’ve read in such a format. For a full novel I think I’ll still prefer my Kindle when reading digitally, but a shorter novella such as Alice’s Tale works all right for quick bursts of reading while on break at work, etc. It’s difficult to say too much about a story as short as this without giving things away, but the basic premise is the 1st-person protagonist is a young man whose work involves searching through digital news content to find the next “big thing” and then buying or selling stock accordingly. His assistant in all this is an A.I. hologram named Alice, and the conflict of the story arises when Alice begins to behave in slightly suspicious ways. It’s a pretty basic premise with simple characters, and the story plays out in a straightforward yet leisurely manner, taking its time to delve into all the ins and outs of the protagonist’s work and daily agenda. To be honest, it’s not a particularly exciting or engaging story. There are a few interesting observations on the protagonist’s part, but the nature of Alice’s involvement in the story being a mystery keeps the story from focusing much on her or the role of A.I. in the near-future in general. In other words, not much in the way of sci-fi for this story, and certainly not with a level of characterization that could be compared to something like the anime Time of Eve. On top of all this, once the story finally begins to build up steam–it’s already over. Perhaps this can simply be attributed to the piece being a novella, and as such the aims of the story are much more concentrated than what would be expected of a full novel. 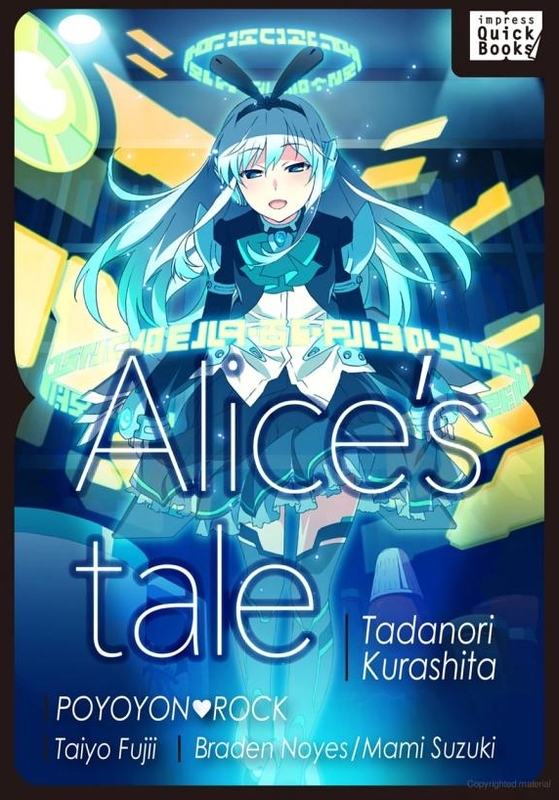 So if you are in the mood for a brief snapshot of a sci-fi setting through a work-focused slice-of-life sort of narrative, I’d say Alice’s Tale is worth picking up, considering its low asking price and overall quality translation. (I will note though, that on my phone at least, all em dashes appeared as question marks for this story. I don’t know if that’s the result of faulty formatting of the text itself, or if it’s an issue on my end.) Alice’s Tale is something different at the very least, and some may find it a pleasant diversion, along with the other two titles available from Impress QuickBooks.